The City of Los Angeles is currently in the process of updating its Bicycle Plan, also known as Chapter IX of the Transportation Element of the General Plan of the City of Los Angeles. To the uninitiated, the Bicycle Plan sounds like a hopeful planning document with the potential to lay down policies and plans that will integrate cycling as a transportation solution, complete with positive environmental impacts, health benefits and congestion relieving results. To those who have been paying attention, the Bicycle Plan more closely resembles another LADOT funding scheme, short on vision and long on opportunity to fund uninspired roadway projects with the limited funds made available for Bikeways projects. Rita Robinson, General Manager of the LADOT, offers her support for the Bicycle Plan explaining that it will allow the Department of Transportation to apply for the State’s Bicycle Transportation Account (BTA) funding. Mia Birk, the consultant from Portland who facilitated the Bicycle Plan workshops earlier this year, opened the session by explaining that the Bicycle Plan was necessary to qualify for BTA funding, and then went into an overview of the “17 points of compliance” necessary to qualify for funding. Was this a funding seminar? Most recently, LADOT’s Bikeways Coordinator appeared before the City Council’s Transportation Committee to report on the progress of the Bicycle Plan update process and reported that the Bicycle Plan was necessary if the City was to qualify for the Metro’s Call for Projects and the State’s BTA funding opportunities. This “focus on funding” might be a good thing if it resulted in the means to develop and implement a “vision” that resulted in an improved environment for cyclists. Unfortunately for the community, the results are not there. For example, the LADOT has succeeded in funding only two projects using BTA funds out of the $50 million made available statewide over the last 7 years. The first funded project was in the 05-06 funding cycle and was for a section of the LA River bike path with an award of $500,000. The LADOT took the $1.25 million for the quarter mile of bike lane on the Fletcher Bridge and then applied to the Metro for the same project, calling it a “Bikeway Improvement” and asking for approximately $7.5 million, referring to the total value of the project as $20 million. In other words, the LADOT has funded a Bridge-Widening project using Bikeways Improvement money by disguising it as a Bikeways project. It is against the backdrop of the extravagant Fletcher “bike lane” project that cyclists ask about simple improvements to the cycling environment such as better curb lane maintenance, traffic signals that recognize cyclists and more bike parking throughout the city. It’s unfortunate that cyclists have to rely on specific funding and aren’t simply included in all roadway design, improvements and maintenance projects. That day will come soon. In the meantime, the meager funding set aside for cyclists ends up cobbled together to fund projects that fail to demonstrate a commitment to cyclists as much as they demonstrate a commitment to road widening. The Bicycle Plan has the potential to be a significant and powerful document, full of vision and promise and hope. For that to happen the Bicycle Plan needs to start with Equality as the principle that drives all Engineering, Education, Enforcement, Encouragement and Evaluation options and choices. Feedback, both pro and con, is great. Especially if it leads to a discussion, a dialogue, a conversation that gets the issues out and into the public arena where they belong. My CityWatch article on LA's Bike Plan stirred some great feedback, some of which I'd like to share with you. "C" … cut right to the chase and offered up "Bulls---!" as his simple and succinct response to my claim that "The Bicycle Plan has the potential to be a significant and powerful document, full of vision and promise and hope." "JL" … went to the other extreme and offered a lengthy response, agreeing with the main points: "1) the LA City Bicycle Master has flaws, 2) LA City’s pursuit of state bicycle funding (BTA – Bicycle Transportation Account) has been flawed, and 3) the massive-multi-million-dollar infrastructure approach to bike lanes on Fletcher Drive is very deeply flawed…" and then defending LA's Bike Plan by claiming "the bike plan has resulted in the meager numbers of bike lanes that we do have on LA City streets. We wouldn’t have the bike lanes on Silver Lake Boulevard, Griffith Park Boulevard, Sunset Boulevard and Venice Boulevard had we not had them in the plan, and had not advocates (in those cases, the LACBC circa 1998-2002) fought for them." "LL" … was concerned about the Bikeways improvements in the area and the impact on the community, especially if it was going to impact parking for the businesses on the Atwater Village side of the Fletcher Bridge. He was also confused by the BTA funding and was under the impression that the bridge was due for seismic retrofitting but that it was funded by Prop G money. Of greatest concern to him was the simple fact that so much was going on in the neighborhood, but without his knowledge. "LL" is active in the community, owns a business within sight of the bridge and is of the opinion that the community should be involved in decisions that affect the neighborhood. "OF" … had questions but never revealed his opinion on the issues, simply concluding our email exchange with words of encouragement. "I'm enjoying reading many of your recent City Watch pieces. I hope you're having fun writing them." "RM" … clarified the funding issue by asking "Didn't you realize that the Fletcher Bridge is 40 miles long? That's why its Bike Lane markings cost $7 M." He offered that the price would be even higher if Leonardo Da Vinci where still alive to work as a subcontractor, painting stripes for the City of LA. I still haven't heard from "GO," a Traffic Engineer who took me to task last week for my position on public participation in the “science” of transportation. Last week he wrote "While I may agree that the methodology of the existing system could be improved it is not something to leave to a local plebiscite." Of course, the week isn't yet over! For the last three weeks, the agendas of the Transportation Commission, the Transportation Committee and the City Council have contained LADOT proposals to increase the speed limits on streets throughout the San Fernando Valley. In spite of the almost year long effort that precedes the speed limit proposal’s appearance on the agenda, this is often the first time the community has heard of the speed limit proposals and the 72 –hour notification process doesn’t give much time for reaction. At issue are the speed limit surveys that the LADOT performs in order to certify the speed limits of local streets in order to issue certificates that allow the LAPD to enforce the speed limits with radar. The City Council musters a quorum and the proposals are bundled up and approved as part of the consent calendar and a very tight year-long process takes place with nary a speed bump…unless the community finds out! Three weeks ago, the Woodland Hills Warner Center Neighborhood Council noted the agenda items referring to speed limit increases on three streets in the West Valley and sent a letter to the Transportation Commission saying, "These proposals were never presented to the Neighborhood Council.” How does the NC advise the City on the delivery of services if the LADOT doesn’t present to the NC? The Transportation commission voted unanimously to reject the LADOT proposals and advised the LADOT to communicate with the neighborhood council. Two weeks ago, several speed limit increases appeared on the agenda for the Transportation Committee. Members of the Bike Writers Collective showed up to speak in protest but the protests fell on deaf ears. Last week, the Transportation Commission met and the West Valley speed limit proposals were back on the agenda. The speed limit proposals hadn’t been presented to the Neighborhood Council Board for input and in fact the WHWCNC had met the night before and approved a motion opposing any recommendations that don’t first come to the NC for approval. The Transportation Commission, to its credit, grappled with the issue but ultimately resolved that it is not within their authority to require the LADOT to interact with the Neighborhood Councils. Over the last three weeks the Woodland Hills Warner Center Neighborhood Council has been joined by the Granada Hills South NC, the Northridge East NC, the Granada Hills Chamber of Commerce, LAUSD Board Member Tamar Galatzan and concerned community members who all believe that the LADOT should involve the community in the business of the community. Rita Robinson, General Manager of the Department of Transportation, acknowledged that the current system does not require the LADOT to present its projects and proposals to the Neighborhood Councils but that she was open to exploring possibilities for better communication. The City Charter provides that information from the City Council, Council committees and City boards and commissions should be sent to Certified Neighborhood Councils as soon as practical so that they are afforded as much opportunity as is practical to provide comment before decisions are made. It also provides that City department officials should have periodic meetings with neighborhood councils. It is now up to the Neighborhood Councils to establish a standard for communication and a process for making it happen. Perhaps the place to begin is the already existing unsigned Memorandum of Understanding between councils and Robinson’s LADOT. The MOU could set the minimum standard for communication. LADOT. Neighborhood councils. It’s time to start talking. Care to join me? Who’s Listening to the Neighborhoods? A little over six years ago, Jennifer Liu finished her school day at Granada Hills High School, walked off the campus and into the crosswalk at Zelzah Avenue and Kingsbury Street where she was hit by a car. The impact of the collision was so great that the halves of her brain were separated. Her collarbones snapped, her ribs were broken and one of them speared her right lung. Blood trickled out of her ears and nose. Jennifer’s father, David Liu, came out of the experience committed to improving the Zelzah Avenue and Kingsbury Street crosswalk. 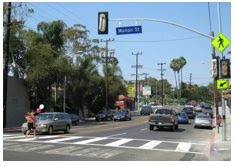 Community members, school staff and school supporters joined him in the fight, all in an effort to have the City of Los Angeles install a “smart” crosswalk, one that would alert motorists to the presence of a pedestrian. The battle has not been easy. Last year the City Council addressed the fact that 33 of the most dangerous street crossings for schoolchildren had not received safety improvements even though the city has had funding for the work for years. LADOT Assistant General Manager John Fisher blamed the 2001 hiring freeze for putting them behind schedule and explained that the department had picked up the pace on special projects since hiring an additional 13 workers in 2006. One councilman angrily responded, "Our Department of Transportation is one of the slowest, most bureaucratic departments in the city. I am constantly banging my head against the wall to get them to do what I want them to do." As for Zelzah and Kingsbury, ground was broken months ago, equipment was installed and the “smart” signal remains wrapped up and inoperable. Community advocates, parents and school staff are frustrated with the situation, one that is aggravated by the LADOT’s recent proposal to raise the speed limit on Zelzah Avenue, all as the community works to calm traffic and address the congestion in the area. The LADOT pleads helpless in the speed limit raising proposal, pointing out that they merely conduct the engineering and traffic surveys that are required as a condition of certifying the speed limits, all in accordance with state law as a condition of using radar to enforce speed limits. 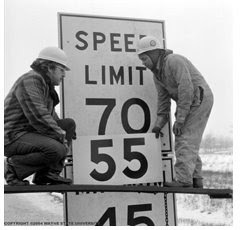 Which means, the LAPD can’t use radar on speeding motorists until the speed limit survey certifies the speed limit, but the large number of speeding motorists “vote with the gas pedal” and the new speed limit is set at the 85% mark so the speed limit is raised. Now the LAPD can use radar on the motorists who are now not speeding because the speed limit just got raised. All of this on Zelzah Avenue, which still does not have a functioning “smart” crosswalk at Kingsbury. Through it all, community members are asking the LADOT, the Transportation Committee and the Transportation Commission how all of this takes place without community involvement. Two weeks ago, the Transportation Commission rejected three LADOT requests for speed limit increases in the West Valley simply because they had not gone to the Neighborhood Councils as part of the process. Last week, the Transportation Committee had six LADOT requests for speed limit increases on the agenda. Members of the community spoke in opposition, arguing that the proposals had not gone to the Neighborhood Councils, that the proposals were in conflict with efforts to calm traffic and establish walkable, rideable, livable communities and that the criteria for evaluating appropriate speed limits was outdated and ineffective. The Transportation Committee pulled the Zelzah Avenue proposal and then approved the other 5, including Reseda Avenue, which would increase the speed limit from 40 to 50 mph alongside a bike lane. Who sets the priorities for the Department of Transportation? Why are the Neighborhood Councils not involved in evaluating and advising the city on transportation projects in their communities? What is the LADOT’s record for delivery on Safe Routes to School projects and what happens to the funding on projects that the LADOT fails to deliver? It's been three years since my wife and I joined representatives from four Neighborhood Councils and sat down with the senior Management of LA's Department of Transportation to develop a memorandum of understanding, all as part of USC's Civic Engagement Initiative. Dr. Terry Cooper and his team from USC's School of Policy, Planning and Development facilitated the event which spanned several months, (including two holiday weekends as some of the LADOT staff repeatedly pointed out) and included moderated team building exercises designed to encourage empathy and a win-win working relationship. The participating NC's were Silver Lake, Hollywood United, Northwest San Pedro and Mar Vista, each sending five representatives who met on weekends with a team from the LADOT led by Assistant General Manager John Fisher and Senior Transportation Engineer Glenn Ogura. Through it all, I found the opportunity to develop relationships with the members of the LADOT and the other NC's to be of tremendous value, a benefit that I value to this day. I also thought the final work product, the LADOT/NC MOU, was of value and I was proud to have participated in its creation. The journey was not without drama with some neighborhood council reps demanding that the process include the Department of Planning and threatening to withdraw if changes weren't made. The NC reps also found that the DOT representatives were unwilling to accept terms such as "major project" and "significant impact" without great debate that resulted in a watered down MOU. Ultimately, we completed the process and produced a document that was approved by the participants and then sent to the respective NC's and the Department of Transportation for endorsement. The Boards of the four councils each approved the MOU and I was honored to be selected by Hollywood United to serve as its NC rep, serving as the primary contact for the DOT. The project leader, Thomas Bryer, called to invite us to USC's Rose Garden for a small ceremony to commemorate the signing of the MOU and the commencement of the "new" relationship between the NC's and the LADOT. The ceremony never took place. Since then, Bryer finished his work at USC. He is now known as "Dr. Bryer" and is a Professor of Public Administration at the University of Central Florida. Gloria Jeff has come and gone as LADOT's General Manager and the department is now led by Rita Robinson. As for the NC's relationship with LADOT, not much has improved. The LADOT recently appeared before the Transportation Commission with recommendations for speed limit increases in the valley. Ms. Robinson was asked if the department had notified the neighborhood councils of the proposed changes and she responded, "No. We are not required to notify the neighborhood councils of actions such as this." Perhaps it's time to revisit the City Charter. Meanwhile, we wait, acutely aware that the LADOT never promised us the Rose Garden. Read the proposed NC/DOT Memorandum of Understanding here .